If you need further data we are happy to customize a solution that fits your specific needs. All three main plans are recurring subscriptions, meaning they will renew and bill on the same calendar day of each month. We also offer your annual agreements to help fit your business and budget needs. Please reach out to the sales team to learn more. If you sign up for an annual plan on the Business or Enterprise level you will receive a welcome call, introductory training, 90 day onboarding plan, onboarding emails, quarterly training (once a quarter for business, unlimited for enterprise) and quarterly email reviews (3 for business and 3 (per user) for enterprise. These training sessions will walk you through the ins and outs of our software in order to get the most ROI. The picture above is the comparison of our plans, which you can review in full on our Prices page. For digital agencies and in-house SEO and SEM teams, we also offer multi-license plans. Depending on your company’s needs, you can define the number of user licenses and customize the SEMrush products on your subscription. With an enterprise account, depending on your price point, you can get custom limits, custom keyword databases, and unlimited crawling of larger websites. If you sign up for an annual plan through one of our sales representatives you will be contacted by one of our customer success managers to set up your training plan. The difference between packages is in the number of limits on your account and the advanced features you gain access to when you upgrade from Pro to Guru or Business. The major benefits of upgrading your SEMrush subscription are broken down below. 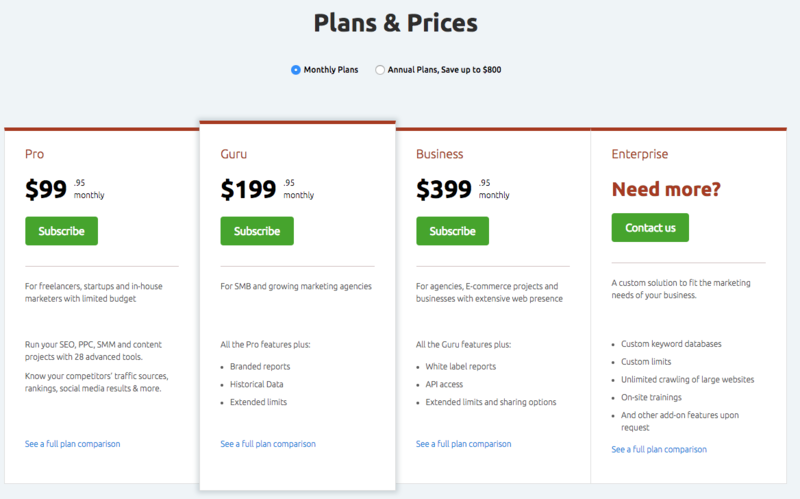 For a full breakdown of the subscription, plan breakdown check out this article here. You can use SEMrush with a free account, but the number of features and amount of data will be limited. You can set up 1 Project, with the ability to set up each project tool once. A standard subscription plan grants all of the basic SEMrush tools for specialists with a limited budget. Historical data – Having only live analytical data is not always enough to make educated decisions, so our Guru and higher-level subscribers can explore our database archives, which go back as far as January 2012. Multitargeted Tracking – To get the whole picture, businesses with an extensive online presence have to monitor it with precise targeting (combination of location, device, and language). Starting from the Guru subscription you can track a website’s search visibility across multiple devices and locations within a single campaign. API access – Choose the way you get SEMrush data. Extract the information that is relevant to you, and integrate it into any kind of user interface, application, widget, or dashboard. White-label PDF – Remove any SEMrush mentions and add your own branding to create clean and professional reports. Complete Access to Traffic Analytics - Access all of our Traffic Analytics reports. This includes the traffic sources, geographic distribution, destination sites, historical data, and device types that are sending traffic to any website in our database. Product Listing Ads Research – Optimize your Google Shopping campaigns with SEMrush PLA data. “Read-only” sharing – If the number of people involved in your projects keeps growing, you can start restricting editing rights. AMP checks in Site Audit – Accelerated Mobile Pages (AMP) is a great way to provide a mobile-friendly experience, and our Site Audit will ensure you’ve implemented it correctly.